continued to make occasional guest shots. DC was the first to create a team of heroes for the sole purpose of housing former series stars. That team was The Losers, which consisted of Johnny Cloud, Navajo Ace (an Army lieutenant who starred in All-American Men of War from 1960 to '66), Captain Storm (a Navy man whose title ran 1964-67), and Gunner & Sarge (a pair of Marines who lacked actual names, but still headlined Our Fighting Forces from 1959 to '65). This unlikely team came together when all were rescued, separately, from losing missions, by The Haunted Tank in G.I. Combat #138 (November, 1969). The story was written by Robert Kanigher (Rex the Wonder Dog, Wonder Woman) and drawn by Russ Heath (Marvel Boy, Little Annie Fanny). Despite the fact that all came from different branches of the service (and despite, also, the obvious lack of esprit de corps evidenced in the group's name), The Losers stuck together and began a series of their own in Our Fighting Forces #123 (February, 1970), where they replaced Hunter's Hellcats (which was never seen again, proving not all losers qualified for membership). They also beat the odds — and their own name — by hanging on until #181 (October, 1978), when Our Fighting Forces itself ended, making theirs among the longer-running war series at DC. But DC had a long-standing precedent for combining members of different branches of the military into cohesive groups. 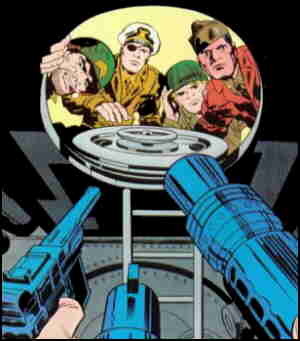 The first team series ever to run in an All-American Publications comic book, where later teams included The Justice Society of America, was Red, White & Blue, whose component individuals came from both the Army and the Navy. All-American, where The Flash and Green Lantern started, was later absorbed by DC so thoroughly, it's hard to think of its properties as ever having belonged to another company. A large number of talented creators handled The Losers over the years. Perhaps most notably, from Our Fighting Forces #151 (November, 1974) to 162 (December, 1975), they were done by the legendary Jack Kirby, who was also doing Kamandi, The Demon and other work for DC at the time. These were Kirby's first stories about ordinary World War II military men since Sgt. Fury & His Howling Commandos. Other writers and artists included, but were not limited to, George Evans (EC Comics, Secret Agent Corrigan), Murray Boltinoff (editor of Tomahawk, Doom Patrol and more) and Joe Kubert (Viking Prince, Hawkman). The Losers were killed off in 1985, in Crisis on Infinite Earths; and their deaths (set in the closing days of the war) were ratified in a special published that same year. Death in comic books shouldn't always be taken seriously, but since these guys have never been used in a post-war setting (and rarely been seen at all in the past couple of decades), maybe they finally did lose for real. In fact, one of their very few later uses was in DC: The New Frontier (2003), in which they died again, in a different way. Also in 2003, DC launched a new series called The Losers, through its Vertigo imprint (The Sandman, Hellblazer). But this one contains all new characters, is set in the present, and has no connection to the Losers of World War II. Text ©2006-10 Donald D. Markstein. Art © DC Comics.